Salzberg, a restaurant in the calmer area of Vienna’s 6th district, serves a great combination of traditional Austrian cuisine and more alternative, contemporary visions (I think I may have that wording from their website). 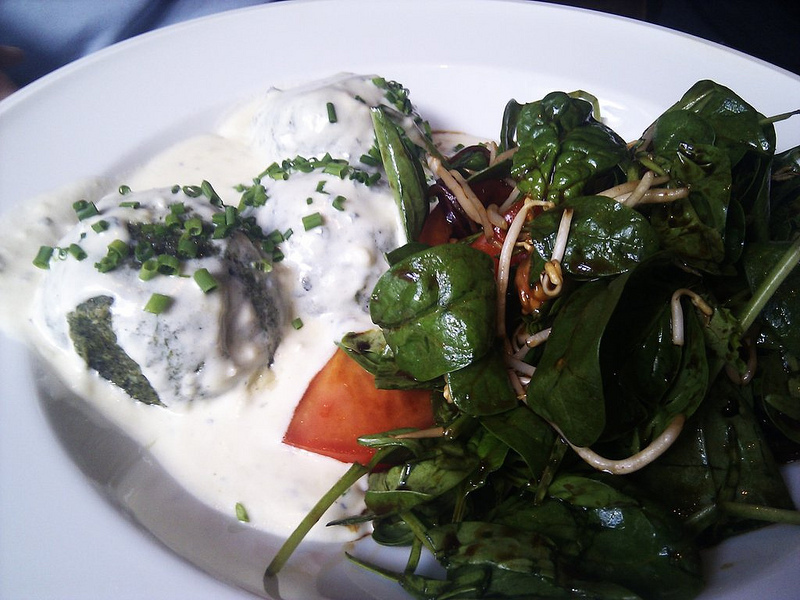 They offer a vast array of vegetarian dishes, one of which is spinach-dumplings (basically a dumpling with loads of spinach worked into it, go figure). Being a carnivore myself, I opted against these (but managed to snap a picture anyway) and decided to feast on another staple of Austrian cuisine, the Zwiebelrostbraten (I’ve written here about it extensively, just have a look at this one posting). It also features a patio during summer, so it’s definitely a place to go for either full-fledged dinners or a drink after work (their wine-cellar is well-stocked too). Marvel below at an image of Zwiebelrostbraten.